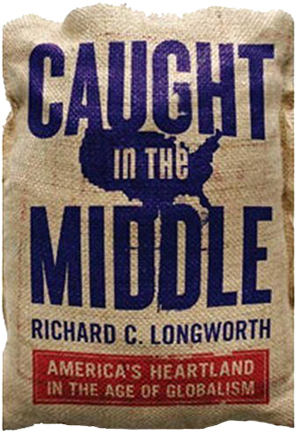 Above: Richard Longworth, Caught in the Middle. Found via the Chicago Tribune article by Hugh Dellios, Midwest must unify to compete in global economy, researchers say. Here is another review of the book via the Chicago Council on Global Affairs, who are also hosting a conference this week, Global Midwest Initiative. As Delios points out, the timing of this topic could not be more controversial, given the global economic crisis, but the ideas are worth looking into. This entry was posted by Erik Brandt on Thursday, October 9th, 2008 at 9:33 AM	and is filed under Aktuell, Education, Globalization, Graphic Design, International, Minneapolis.